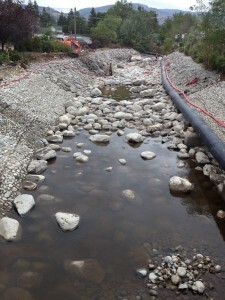 The Penticton Creek Restoration Project is moving ahead as planned, with final placement of river rock, removal of silt and water to be released from the bypass tunnel to the main creek bed later this week. The City of Penticton hosted a hard hat tour for media and elected officials last week, with the full extent of the restoration project visible from Ellis Street bridge and the walkway. Three riffles and pools will replace a homogenous concrete flume for an 80 meter stretch of creek, with boulders and small round river rock to provide improved habitat for fish on this once very productive system. Although this was an extremely complex process to undertake, the City of Penticton and conservation partners moved forward with the support of funders; Habitat Conservation Trust Foundation, Federal Recreational Fishery Conservation Partners Program, and TD Friends of the Environment.